By LUDWIG VON KOOPA - Two of these things are not like the other three. I wrote on Friday that the announcement of Paper Mario: Color Splash was the worst thing to happen on Thursday last week. I wrote that I'd complain about it for months. That might be hyperbole. But it also might not. Here's the official start of it. I'm joining this whole Internet chorus of complaints about Paper Mario: Color Splash. It all stems from the trailer, so I'd like for you to take another look at it. I'm embedding the trailer from the European Nintendo Direct, because it has slightly more information than the American one. One thing Bill Trinen does that Nintendo of Europe Satoru Shibata does not do is refer to Paper Mario: Color Splash as an “action-adventure” game, specifically that Nintendo “always tries to challenge ourselves to bring something fresh to the action-adventure genre.” Nintendo only began to refer to Paper Mario games as action-adventure starting with Paper Mario: Sticker Star. They were “Role-Playing” before. That's not a good sign, if we don't want another Paper Mario: Sticker Star. And believe me, we do not want that. There are several arguments that optimists have to stay hopeful about the quality of Paper Mario: Color Splash, including that one cannot judge a game by its first trailer. How can we judge what direction Paper Mario: Color Splash is taking from just its first trailer? Well, let's compare it to the first trailers for the other Paper Mario games! One can learn a lot about a game's direction from the first trailer — it's the developer's/marketing department's first opportunity to leave an impression on what the game experience will be like. What's emphasised in that trailer will, presumably, be what the game emphasises as well. This trailer was released at SpaceWorld, the convention Nintendo had before E3. I believe this was the introductory trailer from 1997. It wasn't even called Paper Mario, but Super Mario RPG 2. Imagine if they stuck with that title! ...Well, it probably wouldn't get a similarly-named sequel, and we wouldn't have Intelligent Systems trying so hard to make paper puns the basis of future games in the series. What can we observe from this very preliminary trailer? The plumber had lots of different partners: Kooper, Bombette, Goombario, Parakarry. He's always followed by his partner, and they serve in battle with him. We see unique character designs for classic Super Mario Bros. species. There aren't any original species present in the trailer, but the Toads have different colours. You can see Kolorado and his wife for original Koopas, and of course Kooper and Parakarry. There isn't any real indication about what the game is about so we don't know if there's a story — however, we do see multiple towns of NPCs, including Town Town, Lavalava Island, and Koopa Village. One would think there would be some sort of plot as a result, especially since we very definitively know it's an RPG. No one knew what to expect from this, but when it came out, it became beloved for significantly expanding the canon in a way no other Mario game had done before. Thanks to the previous game, now we have some expectations of what a Paper Mario game should look like! This trailer was from E3 2004, and the game released later that year. There's dialogue and characters galore! Is that the player playing as King Bowser? And Princess Peach? Players got to play as Peach in intermission levels before in Paper Mario, but never as King Dad! And Kammy Koopa is back and escorting King Dad, which promised some fun dialogue. We didn't know anything about the plot, and we saw that Petalburg Village had friendly, yet generic Koopas. The Toad House had a unique female Toad, though. Whoa, there's a scary dragon at the start! We saw some sort of new gimmick with that plumber folding up into a paper airplane, and we saw that lots of badges returned. There's that creepy fat blue thing with hair that doesn't resemble mine in any way, too, following the plumber through this new grey area of bug-looking dudes. There's 101 of them, and it's reminiscent of Pikmin. This “Paper Mario 2” seemed to be what you'd expect from a sequel: The previous game, but it looks better, has more stuff, is bigger, and continues what the older game was getting at. It turned out to be so much more than just what that trailer ended up being. You had no idea what the story would be from that trailer — not a single X-Naut or even Crystal Star in sight, though we saw there's some sort of space for special moves in the battle interface. So based on what we knew from the previous game, you're probably collecting something! Remember when Super Paper Mario was supposed to be out on the Nintendo GameCube? Well, it was. This was the first trailer we saw of it, from 2006, and there's absolutely no information about the game to really be gleaned here. These partners seemed to be replaced with these weird things, but you could somehow switch between playing as Mario, Princess Peach, and King Bowser — and go through a lot of environments, including space and a gravity-messed place. Looks like one can also play in a 3D environment, sort of, but only with the plumber. Obviously, if you're a Paper Mario fan in the vein of the first two games, you're wondering what happened. Where is the battle interface? What's with this real-time stomping? You can see experience points and damage being dealt to enemies, but since the trailer specifically omits any interfaces at all (including the menu to switch between Mario and Peach), you have no idea what to expect. Is there a story? Why is Bowser flailing his arms underwater and facing off against his own Koopa Troopas? This was the first time in the Paper Mario franchise that the game was being co-developed by Nintendo SPD instead of just Intelligent Systems. If Paper Mario fans were reacting to Super Paper Mario the way they are to Paper Mario: Color Splash, they'd be very concerned about all these unexplained changes. You can see some people's reactions to the game and its trailer at the time here. They basically thought it was a whole game of the Bowser platforming segments in Paper Mario: The Thousand-Year Door, and thought it probably wouldn't have a story or if it did, it'd be a New Super Mario Bros. excuse plot. (New Super Mario Bros. was a thing on the DS by this time.) Personally, I was extremely excited just to have Bowser as a playable protagonist in a platformer for the first time ever. If the Nintendo NSider Forums were still around, I'd point you to my hyped up posts. 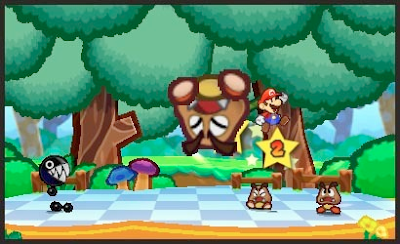 This is the E3 2011 trailer for Paper Mario: Sticker Star, though it was just called “Paper Mario”. Recall the game would come out almost a year and a half later — and in America first, interestingly. Now we have Intelligent Systems, Nintendo SPD, and Vanpool all developing it. For more information on its development, see here. What can we see from this trailer? Well... the trailer starts in a storybook. IN A STORYBOOK. That's gotta mean the game itself has a story, right? People didn't doubt the story-ness yet. What was a bit weird was the fact that there weren't any partners or Pixls or anyone following Mario. Well, no, there was the green Toad, at least. That gave people the impression that there could be partners, but they weren't programmed in or something. Or they wanted to hide them. We need a Greg Gutfeld Show “Where are they now?” segment for the Chain Chomp. The reason people were optimistic about partners is because this trailer did not mark the first time we had any information on “Paper Mario 3DS.” We heard about it in 2010. It was announced at E3 2010. Later in 2010, Nintendo Power gave screenshots featuring a Chain Chomp partner. The Chain Chomp was different than other partners in the series — it looked like an ordinary Chain Chomp. “I can't wait for this game. It'll be one of the best, if not the best, game announced for the 3DS. Aren't these so sad to look at? This was the time when the big villain among Paper Mario fanatics was Super Paper Mario. Everyone was so happy that we would get another game like Paper Mario and Paper Mario: The Thousand-Year Door. Most depressing is that comment about how Nintendo noticed and took into account the fans' reactions to Super Paper Mario, so as a result they were returning the series back to its roots. It turned out to be the exact opposite, where Nintendo claimed it was the fans' reactions to Super Paper Mario that made them take OUT the story! But, as we learned, this was all a falsehood. Still, people didn't want to believe the game had changed so drastically in the span of a year, so they didn't see that E3 2011 trailer as suspicious. By the time the game came out, fans were horrified and devastated at the death of everything the Paper Mario series once stood for. 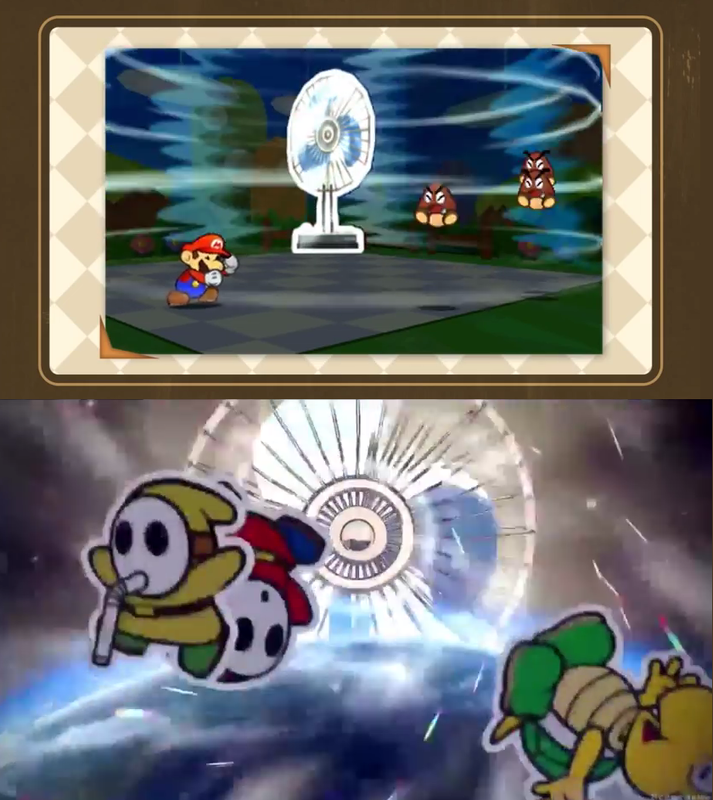 These electronic cooling fans are blowing away and chilling the hype of Paper Mario fans. Can you really blame the fans for now being extremely paranoid and suspicious at this trailer for Paper Mario: Color Splash, which shares in common everything fans disliked about Paper Mario: Sticker Star? No partners. Cards are the same as stickers. Full of generic Toads. The floating paint bucket is clearly just Kersti. Both trailers end in a large fan blowing enemies away! Are the fans of Paper Mario and Paper Mario: The Thousand-Year Door an enemy to be blown away for Shigeru Miyamoto? Or will we be recognised that we're the guys who backed the series in its infancy and given respect and attention? Ludwig did a CRTL + F search to make sure he didn't accidentally write Colour Splash instead of Color Splash. Even in Europe, the game's name didn't have a 'u'! Please keep your comments related to trailer and pre-game release comments across any or all of the Paper Mario games. This article will not be the only one to be published about what we know about Color Splash so far, so stay tuned to KoopaTV for more! Click here for an analysis for how the Paper Mario and Mario & Luigi games prior to Paper Mario: Color Splash have been named/sub-titled. Among a list of 128 videogames, both Paper Mario and Paper Mario: The Thousand-Year Door make Ludwig's top 6. Despite the setbacks of the series, Paper Mario remains highly popular. Upon seeing Paper Mario: Color Splash footage at E3, it seems KoopaTV's opinion of it has changed. Big league. Here's a written explanation on that opinion change. It appears that Paper Mario: Color Splash is defying all expectations. Some more details about what was really behind that Chain Chomp partner. I don't actually remember what my reaction to seeing Sticker Star for the first time was. I just remember my reaction with Super Paper Mario about how excited I was to play an entire game as King Dad. Erm, did you talk to your parents about inventory management?! I did. They probably thought I was crazy. I mean, they raised you. They probably figured you're crazy long before. I have not grown up with Paper Mario because back before I was able to afford my own consoles, my brother was a Sony fanboy so he got a PS1 instead and next gen I got the PS2 as a gift. Only by the Wii generation was I able to finally start playing this series with the Virtual Console and the Wii's backward compatibility with the Gamecube as then I really could buy my own consoles. I probably am not affected by the news as a result as I don't find my "childhood" being ruined. Now if only there was a more adverse reaction by the fandom to a certain series I used to like having less Disney involvement. Did Paper Mario and Paper Mario: The Thousand-Year Door withstand the test of time to you? As in, they're older games, and you played them much after they came out. Someone suggested that we only like those games because of nostalgia. As someone unaffected by that, what do you feel about the games? Confession, I have not played Paper Mario: The Thousand-Year Door yet. But I did enjoy the first game. Maybe I will upgrade it from my Wii's VC to my Wii U's VC so I can play it on my Gamepad. I should buy Paper Mario: The Thousand-Year Door sometime. I only reconnected my original Wii to the TV recently. ...Yeah, go play The Thousand-Year Door. It's even better. I can see why I should go for used. I was hoping for Gamecube VC but it is probably being saved for the NX at this point. That's what they said about the Wii as well. Another hope was to have a remake of the Thousand Year Door like the Zelda titles but that is probably not going to happen any time soon especially if Nintendo wants to move away from the first two games' battle systems especially if they want to forget that the games ever worked like that. Plus, look at the trailers for TTYD and Color Splash. The graphics already are basically the same. It could be ported to a 3DS instead. It won't be a remaster but still be remade for another type of hardware. I'm actually supporting Color Splash. Sticker Star wasn't bad at all, even though I prefer the original games. You're certainly free to do that. Team Koopa's Rio Training Is Going Well! Should Nintendo Go Into Virtual Reality? Build a Snowman or Build a Sandcastle? Petition to Abolish Daylight Savings Time! Mario Kart TV is being shut down! Watch Kamek's Tom Clancy's The Division Stream! Tom Clancy's The Division is Finally Out! Interactive User Interfaces... Helping You LEARN!